Microsoft Excel Spreadsheet (Project Level) - This file contains the content of the digital plan of work in an easy-to-manipulate format. Depending on the stage of the project, this information may be included within a set of employer's information requirements, a BIM execution plan or a set of professional appointment documents. The File is compatible with Microsoft Excel 2010 and above. dpow file - A single file in JSON format that contains all project data. This can be used to create a new project in the toolkit. Suggested uses could be (a) For offline back-up purposes, (b) To pass a digital plan of work to a bidder or a new project lead or (c) To transfer information to a third party software platform. COBie Spreadsheet - Contains the content of a stage in COBie Excel format. This can be used for digital verification against the design information. COBie JSON - Contains the content of a stage in COBie JSON format. This can be used for digital verification against the design information. COBie XML - Contains the content of a stage in COBie XML format. This can be used for digital verification against the design information. IFC - Contains the content of a stage in IFC. This can be used for digital verification against the design information. Note: A loading indicator (spinning icon) will show on the page whilst the export is in progress, this could take a few minutes depending on the size of your project. Deliverables that are covered by the scope of the NBS Create specification content can be automatically generated into an NBS Create specification file. 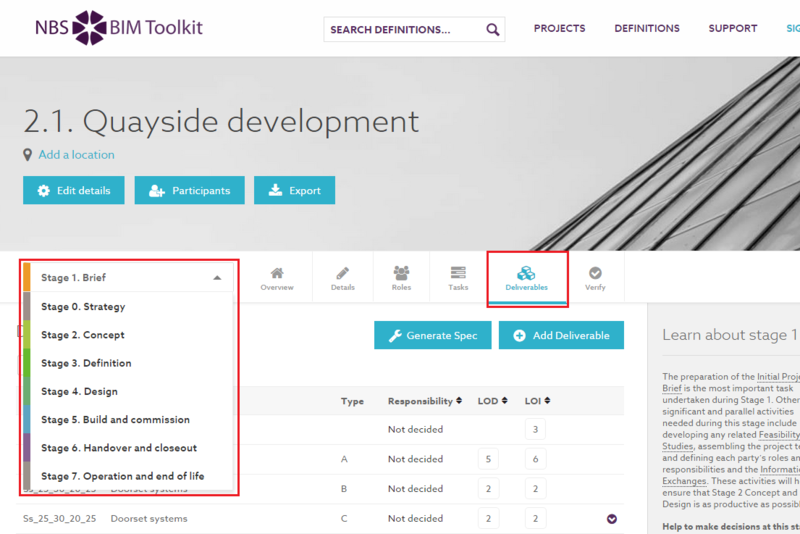 Selecting to generate a specification from the deliverables tab will create a separate file for each member of the team that has been given the design responsibilities. It will also create a specification for all unassigned deliverables. 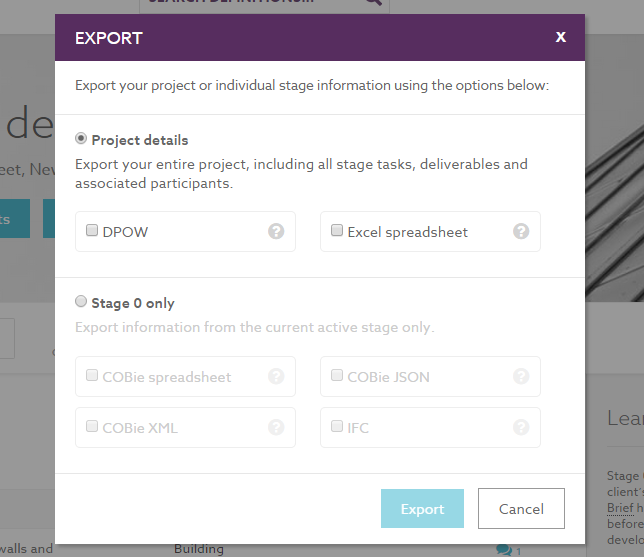 Step 1: From the Deliverables tab, select the stage which you wish to export. Step 2: From the deliverables list, select the "Generate Spec" button. 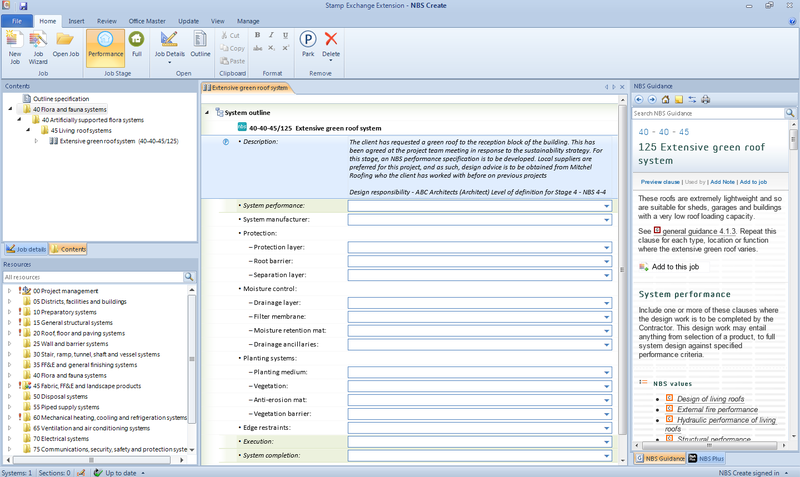 Each NBS Create specification file will automatically include the Project details from your project. As well as each deliverable having the notes, responsibility and LOD/LOI specified against them in the toolkit. Below is an example of a deliverable in the toolkit exported to NBS Create. Along with the NBS Create specification files, there will be a report that details which deliverables could and couldn't be added to each specification. If you have received a dpow file to import into the toolkit, you can do this via the 'Create a new project' wizard. 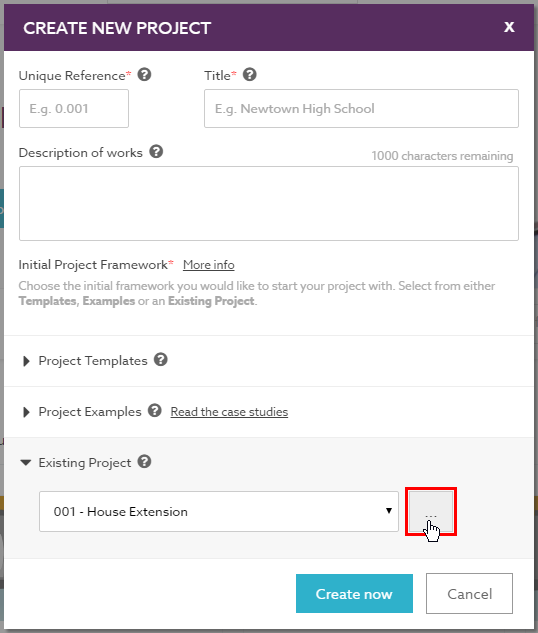 From the header, select the 'Create a new project' link. In the create project modal, you are required to enter a unique reference and project name, as well as a project description if you wish. Once these details have been entered, select the "Use template..." button on the left. On the next step of the modal, select the "Use existing or import project template" radio button. Now available, select the "..." button beside the dropdown. This now allows you to navigate to the location where you have stored the dpow file ready for import. Highlight the dpow file from the browse dialog and select the 'Open' button to begin the import.